There may be princess stories and fairy tales a plenty, but good goblin or troll tales can be difficult to find. 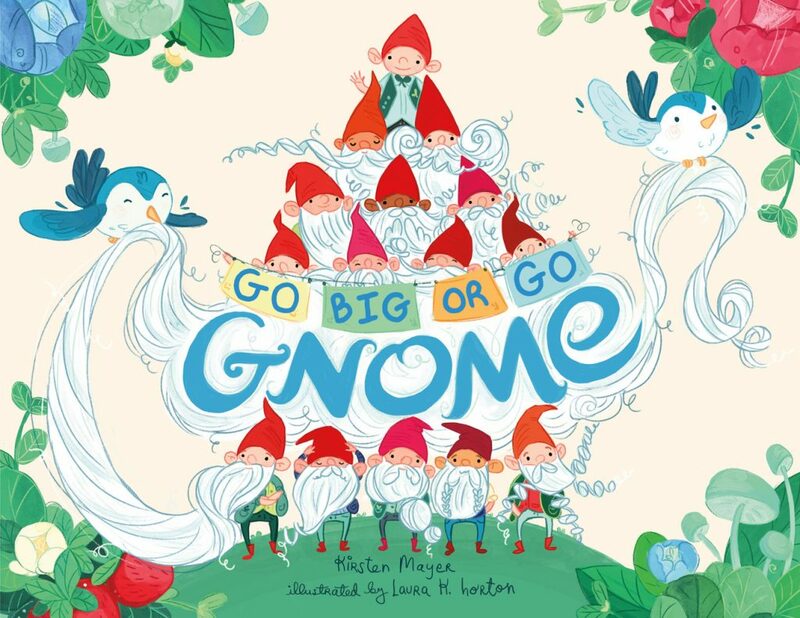 Now Go Big or Go Gnome, written by Kirsten Mayer and illustrated by Laura K. Horton provides a lighthearted and entertaining look at life from a verdantly impish perspective. A tiny gnome named Al lives and works in a lush green garden. He trims shrubbery alongside a crew of friendly fellows who bathe birds, fluff dandelions, and rake rocks. While the gnomes keep busy tidying the sweet scenery, they are also grooming impressive “imperial beards and illustrious mustaches.” Everyone, that is, except Al. Al has nary a whisker on his smooth pink cheeks. This bothers Al tremendously, because he dreams of participating in the Beards International Gnome-athlon. Desperate times call for desperate measures, so Al attempts to enter the contest by faking a beard using tiny white butterflies. They fly away and expose his trickery, so he tries again with a squirrel tail, and then with some moss. Thinking he’s doomed to be a plain, bare-faced gnome forever, Al heads home to trim some topiary and keep himself busy. Luckily he still has his clippers in hand when his best friend Gnorm has an emergency – sap is stuck in his beard! He snips, clips and trims Gnorm’s whiskers into an award-winning look. What will the other gnomes think of Al now? Mayer’s sweet and upbeat tale is a funny fantasy addition to the beard-book genre. Clever language and gnomish word puns add to the appeal. Her text is a delightful set-up for illustrator Horton, who maximizes the opportunity to create inventive, elaborate and impressive beard styles on a pleasant array of diminutive creatures. She also establishes a imaginative garden setting accented with birds, flowers and mushrooms, using a green and blue palette that offsets the gnomes’ de rigueur red pointed caps and boots. Clever and cute, Go Big or Go Gnome is an encouraging tale for young readers in search of their special talents and ready to embrace their true selves far before they reach the whisker-sprouting years. Where Obtained: I reviewed a preview copy of Go Big or Go Gnome from the publisher and received no other compensation. The opinions expressed here are my own.